Greetings on the Eve of Pakistan-India Independence — 70 Years! Sharing a Pledge both countries can commit to while organizing Independence Days tomorrow and day after! Happy Independence Day! Now let us dedicate ourselves to get real Azadi – especially for people of both countries! Mazher Hussain is a member of the TRANSCEND Network for Peace Development Environment. He is Director of COVA and former Board Member of State Bank of Hyderabad. COVA (Confederation of Voluntary Associations) is a national network of voluntary organizations dedicated to the issues of social harmony, peace and justice. Its prime focus is on citizenship rights and on perspective building for harmony and peace in South Asia. Through direct programmes and by networking with other CSOs, COVA organises perspective building activities and programs, carries out campaigns, and conducts research for influencing diverse sections of civil society and the state apparatus to adopt inclusive, secular and egalitarian outlook and policies that would foster rights and secure justice and peace for all. Email:mazherhussain11@gmail.com. This article originally appeared on Transcend Media Service (TMS) on 14 August 2017. 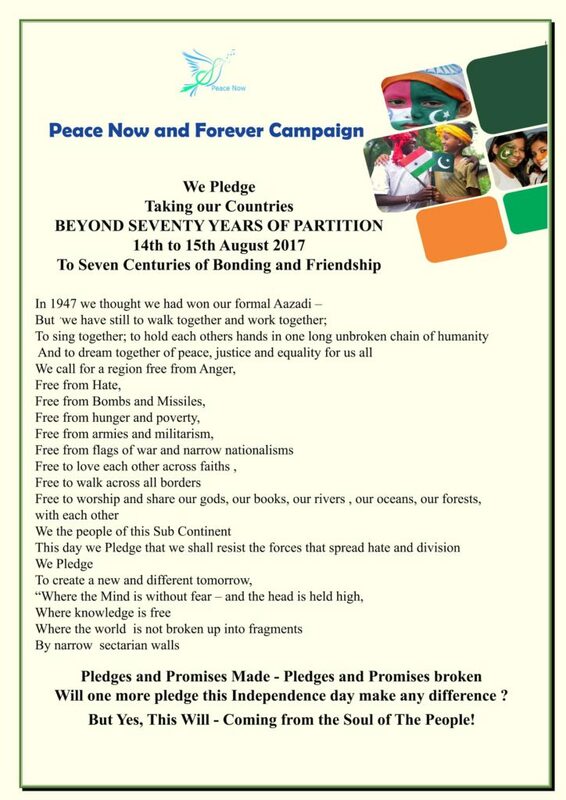 Anticopyright: Editorials and articles originated on TMS may be freely reprinted, disseminated, translated and used as background material, provided an acknowledgement and link to the source, TMS: Pledge on 70 Years of Independence by People of Pakistan and India – 15 Aug 2017, is included. Thank you.